Clothing says a lot about who we are and what we do. After all, clothes can make the man or woman. Purchasing quality clothing is an important investment. Properly maintaining your clothes can better preserve your investment and style. For a century, Arthur Rose Cleaners has been the premiere fine dry cleaning business in Saskatoon. With exemplary customer service and superb attention to detail, we have made a name for ourselves and earned a loyal customer base. 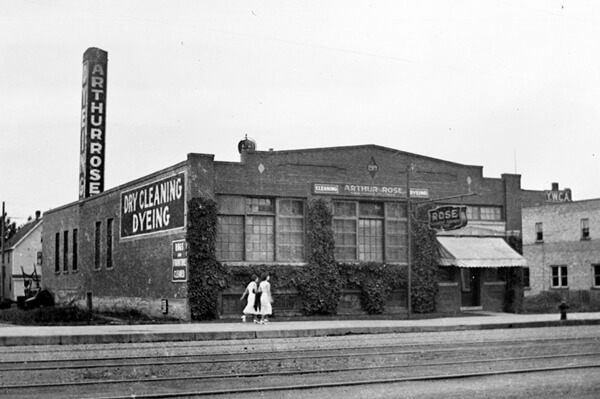 Originally founded in 1913 by Arthur Rose Cleaners, the business was family owned for 65 years. For 15 years, Ron LeFrancois has owned the business–now named Arthur Rose Fine Drycleaning and Launderers. LeFrancois himself has more than 30 years of dry cleaning experience as owner of Custom Cleaners. For LeFrancois, joining with Arthur Rose Cleaners was a natural choice to preserve the company legacy. Arthur Rose is a piece of Saskatoon’s history, and we are proud to usher it into its second 100 years. Over the last century the business has only relocated once, and now resides on Fourth Avenue North to better serve its customers. Many things have changed over the years; state of the art technology has replaced the once pungent petroleum-based cleaning systems. Fibimatic Dry Cleaning Machines are the most advanced in the world, according to LeFrancois, and are been shipped specially from Italy. Arthur Rose and the machines we use are focused on being environmentally conscious. “We properly dispose of waste; the machines don’t vent outside. The new machines retrieve 99 percent of the solvent we use and it emerges crystal clear for re-use. Most importantly, there is no smell in our plant when you walk in,” remarks LeFrancois. In 2016, LeFrancois sold Arthur Rose cleaners to Tasha Kotelmach. With a lifetime of dry cleaning experience – her mother was a dry cleaner and clothing presser – Kotelmach began working in the business at just 5 years old, making hangers and doing odd jobs. The business has continued to flourish under her ownership and provides the same flawless services they did 100 years ago. Though Arthur Rose Cleaners no longer offers pickup and delivery services, we do offer a wide array of services from bedding and drapery, to alterations and repairs. We also offer wedding gown cleaning and preservation, which maintains the garment for years to come. “We look after very high-end garments. [We] clean for high-end hotels like the Delta, Sheraton, and Radisson. We have even cleaned hundred year old gowns for the Museum of Western Development,” notes LeFrancois. Voted the best dry cleaner in the city numerous times by Planet S Magazine, Arthur Rose Cleaners will be serving Saskatoon for another century. “We’re experienced and we’re very good at what we do,” says LeFrancois. To celebrate their centennial, Arthur Rose Cleaners is getting a facelift to better reflect their image with new signage and a completely renovated lobby. When looking for a dry cleaning service, go with the best: choose Arthur Rose Cleaners and you won’t be disappointed. Stop in or contact us today!